Have you ever stayed in a tipi before? I never knew it was even a possibility until I started looking for accommodation near Bryce Canyon. My first thought when I saw the pictures online - "I have to experience this!" Before you pull up images of the tipis from old western films, know this tipi is a little more modern than those. The tipi, named 'Running Deer' by the owner, is made out of canvas instead of animal hides. It fits four people, and is incredibly spacious inside. Even with all of our packs and gear hanging around, my two friends and I had plenty of space to move around and stand up in the tipi. Running Deer has also been built-up on a wood platform. This helps prevent bugs and rain water from getting inside. My favorite part though, was the cozy furnishings inside - Pendleton pillows and blankets, a propane fireplace, four cushy cots, and little camp chairs. All of these extra details really added to the experience and made it stand out from other tipi listings I saw online. For one, the stars are going to blow you away. Running Deer is located on a hill in a sparsely populated area. Bring a tripod if you're looking to practice your night photography, or simply lay a blanket down and look for shooting stars (I spotted one while I was there)! Running Deer is actually one of two tipis owned and operated by the same person. The second tipi is called, 'Soaring Hawk,' and is located directly across from its mate. In between the two tipis is a shared fireplace. This may give you slight social anxiety, but trust me, give your neighbors a chance. We loved ours and ended up talking to them for hours over s'mores and hot dogs. Besides possibly having tipi neighbors, you're out on your own here. 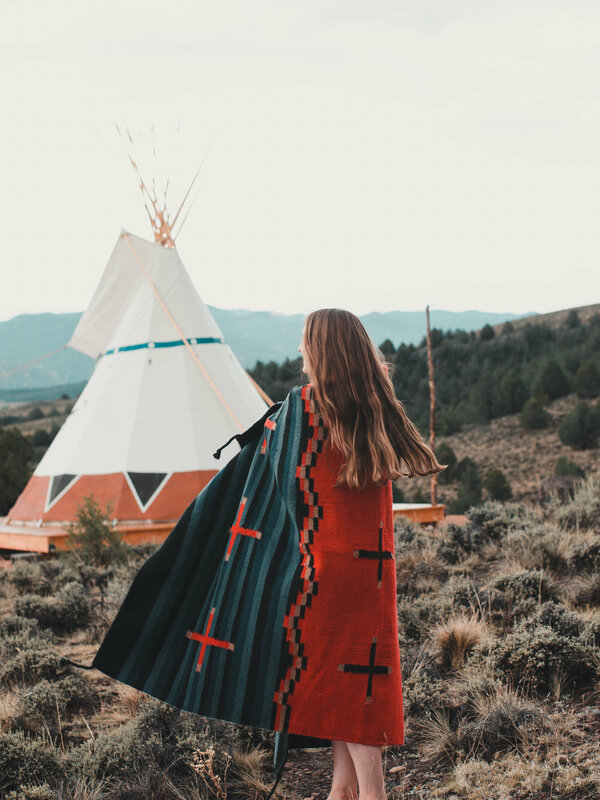 The tipi owner lives offsite, and both the tipis are located on private property. During our stay, my friends and I fell asleep to complete silence, and woke up to find the site just as peaceful in the morning. The Running Deer and Soaring Hawk tipis are located about 30 minutes away from Bryce Canyon, and about an hour away from Zion. For my friends and I, this was perfect. Due to the tipis' relatively central position between the two parks, we were able to stay there for two nights instead of only one. This allowed us to relax a little more and not have to worry about switching campgrounds or packing up our gear. There are a few different campgrounds in the Bryce Canyon area which offer tipi camping. However, after driving past some of the other options, I'm really glad we choose the one we did. Most of the other tipis we saw were much smaller in comparison, and definitely didn't look like they could fit four people. They also sat directly on the ground, and weren't built up on a wooden platform. While this is probably more 'authentic,' and true to how Native Americans once lived, the added comfort at our tipi site was definitely appreciated. I found our tipi through this listing on Hipcamp. Hipcamp is essentially the same thing as Airbnb, but with a camping focus. 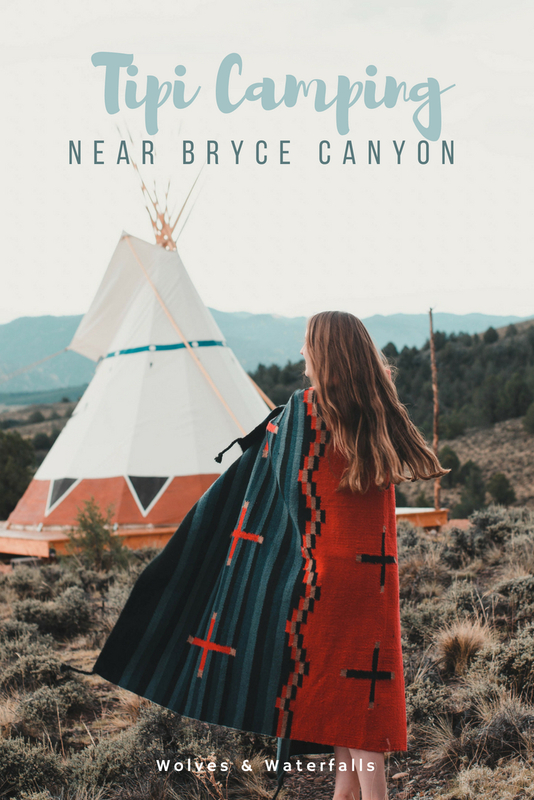 You can also book the Running Deer or Soaring Hawk tipis through Airbnb, VRBO, or the owner's personal website: Canyon Base Camp. Bring your own water. While there's a clean porty potty on site, there's no running water at the tipi. Shower at the nearby Red Canyon Campground. It's only a 10 minute drive from the tipi site. Wake up and watch the sunrise. These tipi sites are on the hill and offer an amazing view of the surrounding area. Wolves and Waterfalls was welcomed as a sponsored guest to the Running Deer tipi site. As always, all opinions are own. would you ever stay in a Tipi?